Another day, another random London bus route. They're not always thrilling, are they? 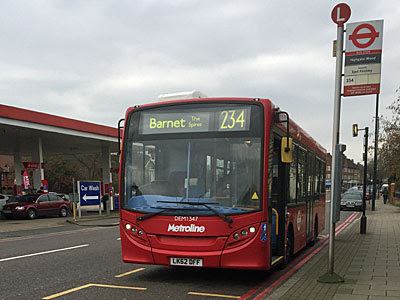 That's not entirely surprising, given that buses are the unsung workhorses of the suburbs, and the 234 is very much one of these. Connecting residential roads to the shops, and the shops to residential roads, what I'm saying is don't get your narrative expectations up. Indeed I thought I'd whip through this one in bulletpoint form, to get it written quicker, and then maybe retire the feature for good. • Oh, the 234. I don't suppose I could allow myself to press the random button again, because nobody need ever know. No? OK, best head to that gyratory road junction on the A1 halfway between Highgate and East Finchley. • Technically this is 'Highgate Wood', although the timbered area in question lies inaccessible behind the emergent Northern line. • While the driver takes a break on the pavement with a fag, I get to stand outside a Jewsons and watch the crew at the American Carwash across the road giving a Mini a good rubdown. • The first other passengers to board the bus make a beeline for the seat immediately in front of me and block my view with their over-sized furry hats. • Look, there's the top of The Bishops Avenue, and McDonalds UK HQ, and the gorgeous East Finchley Picturedrome, now the Phoenix, and a fireplace showroom called Amazing Grates where we turn right. • High on a list of Obscure Historic Locations Most Londoners Haven't Heard Of is Fortis Green, a turn-of-the-century Middlesex suburb. • At a set of temporary traffic lights ahead of us the lights turn red, and we are the fourth vehicle to ignore them. • The Alexandra pub appears to have been taken over by the House of Frankenstein before it closed. If the flats up the road are a 'Luxury' retirement home, it must be on the inside only. • Kerching, Muswell Hill. Lots of buses are drawn here, there being no trains. We pass all the shops, which have a relentlessly middle class vibe, including a dog groomers, more than one artisan bakery and a gelateria. Every passenger except me gets off. • We have a new set of passengers, two of whom have lugged a duvet and a large bag of washing on board. • A short large lady flags us down from the pavement, just as we're heading off, and the driver allows her to board. She waves a purse containing at least 20 plastic cards at the reader, which beeps 'Fail', twice, but the driver lets her on anyway. She is immensely grateful. • A small child sits in the tiny luggage space behind the driver, legs dangling, and shrieks with joy as we head off down the hill. • We turn off up Pages Lane, the 234's job to serve the backstreets nudging up against Coldfall Wood. Gradually all the passengers except me and Short Large Lady get off. • This section is Hail & Ride but the on-board display never mentions this, showing the next stop as 'North Circular Road' for at least five minutes. • Slowly we accrue a fresh set of passengers, none of whom has a duvet. There are an awful lot of allotments to our left. • The North Circular runs in a chasm across the landscape, bordered by a giant Tesco and lots of automotive-based businesses, one of which has a Routemaster parked out front. • So this is Friern Barnet, another important suburb doomed to anonymity because it's not got a station. It must have something, though, because all the passengers except me and Short Large Lady get off. We're going all the way. • The next stop is called Constable Close, even though the next police station isn't coming up for another mile. People are starting to get on again. • It's nice along here, isn't it? All broad leafy avenues lined by increasingly well-proportioned housing stock. • We skim the edge of Friary Park to a large flinty Greek Orthodox Church, ΝΑΟΣ ΑΓ. ΑΙΚΑΤΕΡΙΝΗΣ, originally Friern Barnet's Victorian parish church. There might be a wedding. • The next stop is Golfside Close, which tells you everything you need to know about who lives around here. • At last we reach Whetstone High Road, with its surprisingly long run of consistently half-decent shops. It's all starting to feel a bit Hertfordshire, which once it was. • Our driver pulls in alongside B&Q to radio control. Three passengers on the pavement wait increasingly impatiently to be allowed on board. • On setting off, our driver no longer appears to make much of an effort to get anywhere fast. He then drives straight past the next stop, despite a ding to get off, and earns an unheard curse from the elderly gentleman thus disadvantaged. • Why wouldn't there be a large Travelodge out here? Overnight stays must be a lot cheaper than in the middle of town. And there's a convenient M&S food store downstairs if you get peckish. • A slow descent takes us down the delightfully named Pricklers Hill, where the local Everyman cinema is getting a spruce-up. On the whole more people are now getting on than off, as our final destination proves magnetic. • At Underhill come the best views of the ride, with daffodils and crocuses on the crest of the verge. Down below, Barnet FC's former stadium is destined for rebirth as a massive Ark Academy. 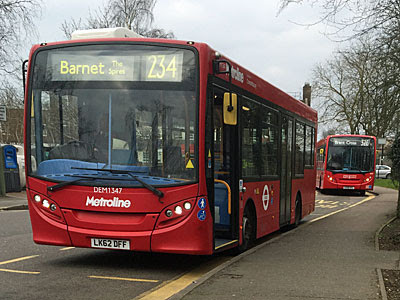 • High Barnet is only the second station this bus has passed, and a sizeable number of passengers take the opportunity to interchange. Only two us climb the broad market-sized High Street, and you already know who we are. • We pass the front of The Spires shopping centre, with its twin Methodist spires all that remains of a different kind of worship. • Our final stop is round the back, between the market and the library. I let Short Large Lady alight first, her freeloading journey complete. • The Spires proves very Eighties inside, an open-air piazza weaving between underwhelming outlets, but Barnet's citizens flock duly through, and some may even ride the 234 home.